This year Age Action celebrates 14 years of Positive Ageing Week and both young and old coming out in force in their towns and communities to celebrate ageing in a positive light. 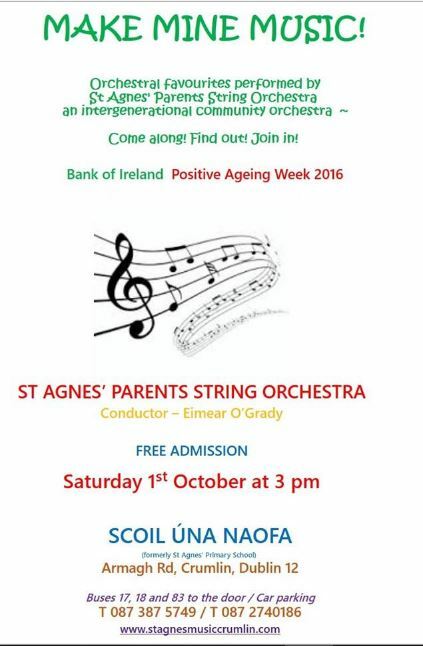 St. Agnes’ are delighted to be part of this celebration and invite you to our concert on 1st October 2016 with the St. Agnes’ Parents Orchestra, conductor Eimear O’Grady. The theme for 2016 is: Celebrating Ageing in Your Community. NOTE - CHANGE FROM PREVIOUS TIME, NOW AT 3 PM. Best of luck to the Dubs, and of course to our Mayo friends for the match afterwards!